Developer Growland has appointed LU Simon to build stage one of its mixed-use residential project Victoria Square, with construction now underway on the first two towers, reinforcing the continued demand for Footscray. 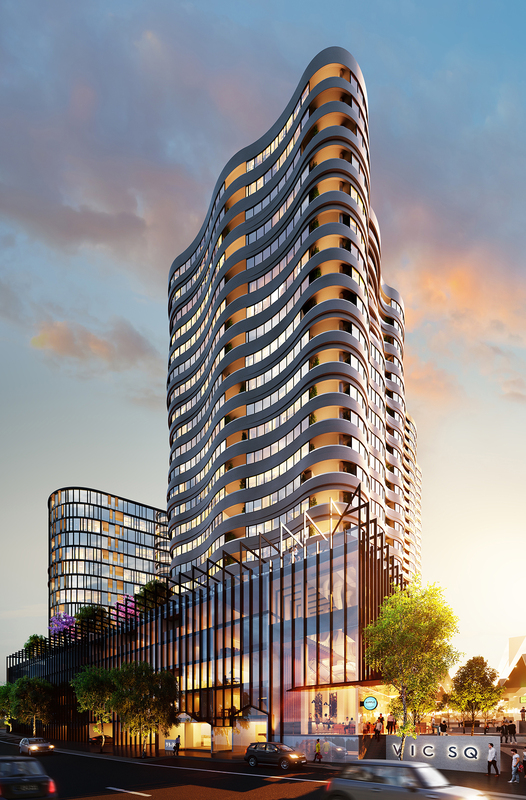 The $600 million project comprises six residential towers of 937 apartments, in addition to over 5,500 sqm of commercial, retail and hospitality space on Hopkins Street. The first phase of Victoria Square is expected to be completed by late 2020 and has achieved sales of 90%. Stage three, titled VS03, has just launched to market and will include a boutique collection of just 86 apartments. Growland says it’s not surprising Footscray has become a hotspot, particularly for young buyers, with research from District Data indicating that the area is in the early ‘hotspot’ phase, providing buyers an opportunity to take advantage of excellent value for money. According to Growland, the company is proud to be partnering with LU Simon, a builder that it says shares its vision for the project and commitment to the well-being of the residents.LU Simon has had a presence in the Melbourne for over 60 years, across a broad portfolio of projects including eight residential projects across Australia currently at construction. Victoria Square is just one of a growing number of residential sites commencing in Footscray, with the suburb now one of Melbourne’s most sought-after inner-suburbs for young homebuyers. District Data indicates the proportion of residents aged 20-39 has increased by a substantial seven per cent between 2006 and 2016. These buyers are driving demand for housing and a subsequent shift in the local built environment, with approximately 282 dwellings currently under construction in the area. The appeal of Footscray as a suburb to buy apartments in is also reflected in it being amongst the 5 most viewed suburbs on Urban.com.au during October, in fourth place. Footscray is an ideal location for young families, working professionals and first and second home buyers. In addition to being just 4km from Melbourne’s CBD, it is a thriving education and employment hub in its own right, which is driving the shift in demographics to younger buyers that want to be close to the action. The multicultural community offers an impressive variety of hospitality options and a friendly and vibrant atmosphere. It’s incredibly rewarding to be able to play a role in the area’s rejuvenation and to create a communal space where locals can enjoy top-quality restaurants and retail outlets. Victoria Square is more than a residential project, it’s a large-scale lifestyle precinct that will help shape the fabric of the Footscray area and bring value to the local community. Given the level of design quality and the scale of the development, it is integral that the builder we partner with has a proven track record of delivering similar projects on time, and to budget. Commencing construction at Victoria Square is an important milestone that we are proud to share with our purchasers and future residents. The median unit price in Footscray is $405,000, which is unheard of for a suburb that is within 5km of the CBD; Flemington, Hawthorn and Windsor are all a similar distance and significantly more expensive. Combine that with a fantastic public transport network, proximity to education and employment and a buzzing café culture, and I have no doubt we will continue to see an increase in demand for apartments in the area.